Apples are a healthy snack for more than one reason. They provide vitamins such as C, A and folate, as well as minerals, including potassium and phosphorous. Apples also offer digestive benefits, lowering your risk for constipation and improving satiety -- especially if you consume them raw and with the skin on. 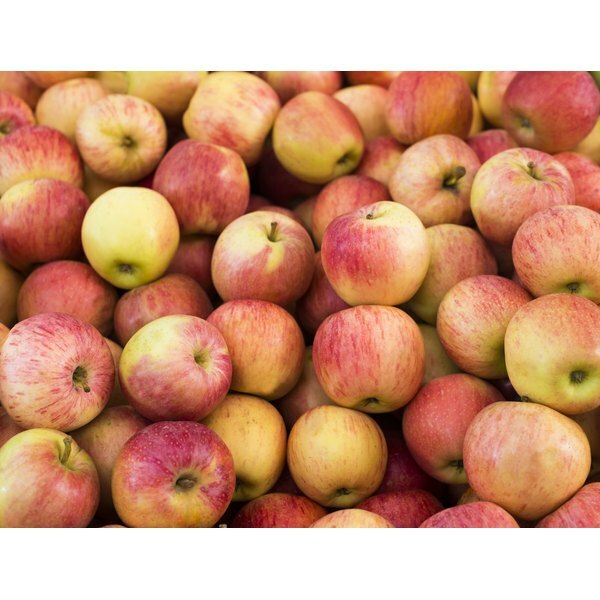 Apples contain insoluble fiber. You consume more insoluble fiber when you eat the apple with its skin on. This type of fiber provides bulk in your intestinal tract. Insoluble fiber helps hold water, softens your stool and moves food quickly through your digestive system. It also helps reduce your risk for diverticular disease, in which tiny pouches develop along your intestinal wall. Diverticular disease causes abdominal pain, changes in bowel habits, cramping, vomiting and nausea and may lead to complications like infections, bleeding, small tears and blockages in your colon. Apples also contain the soluble fiber pectin. This type of fiber dissolves in water and forms a gel-like substance, which slows digestion. It helps prevent cholesterol buildup and helps lower blood glucose levels. Soluble fiber appears to delay glucose uptake during digestion, potentially reducing risk for type 2 diabetes, according to the book “Discovering Nutrition” by Paul Insel, et al. The pectin in apples also might have prebiotic benefits, according to “Nondigestible Carbohydrates and Digestive Health” by Teresa M. Paeschke and William R. Aimutis. Prebiotics are nondigestible nutrients that are used for energy by beneficial bacteria that live in your intestines, called probiotics. Probiotics have many potential health benefits including aiding digestion. Prebiotics help probiotics exert their healthful influence. They may have a role in improving colitis, reducing irritable bowel symptoms, improving gastroenteritis, aiding in calcium absorption and improving certain types of diarrhea. Both types of fiber in apples contribute to satiety. Foods high in fiber, like apples, take longer to leave your stomach. Since fiber-rich foods hold water and add bulk, they also improve your feeling of fullness. A large apple has 5 grams of fiber. The Dietary Guidelines for Americans recommends getting 14 grams of fiber per 1,000 calories. On average, that means you need 25 grams of fiber daily if you are female and 38 grams daily if you are male.